There is a veritable industry out there producing an endless stream of “reports” about imaginary Israeli efforts to destroy, damage or defile Muslim sites, in particular the Al Aqsa mosque in Jerusalem. I have repeatedly written about this vicious campaign that goes back to the days of Haj Amin al Husseini, the Mufti of Jerusalem, who later gained notoriety as a Nazi collaborator. Many recent examples of this ongoing incitement have been compiled by Palestinian Media Watch (PMW), and for the very latest installment, you can always turn to the website of Quds Media Center . 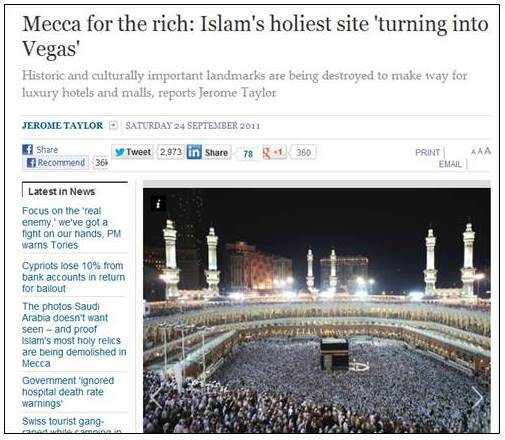 The manufactured outrage that usually accompanies the false reports on invented Israeli transgressions against Muslim holy places stands in stark contrast to the docile silence that has allowed Saudi authorities to transform Islam’s holiest places into glitzy luxury destinations. However, by now several reports highlighting the destruction of historic Islamic sites in Saudi Arabia have appeared in the media. A CNN report includes some fascinating photos dramatically illustrating how much reckless construction has transformed the area of Islam’s holiest site. 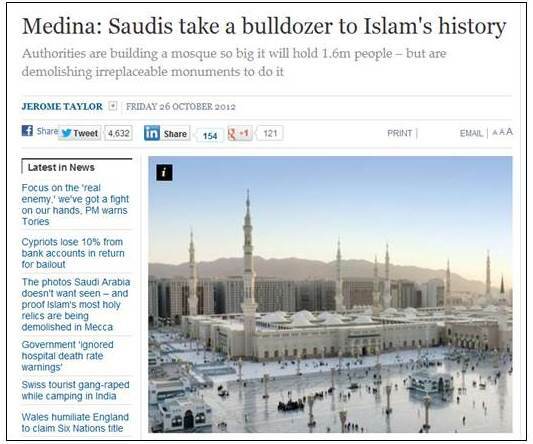 “Lavish skyscrapers now tower over devotees circling the Kaaba in the Grand Mosque. Most imposing is the Royal Mecca Clock Tower, a 120-floor hotel that resembles London’s Big Ben and which, at 601 meters, is the world’s second tallest building. 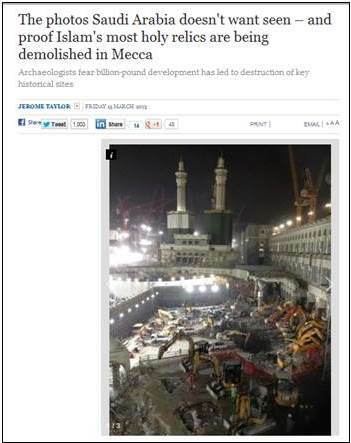 It’s of course a good question given that the affected sites are part of Islam’s holiest places. “One area that you might think would see Muslims speaking out with one voice is the wholesale archaeological and historical destruction of Islam’s birthplace. 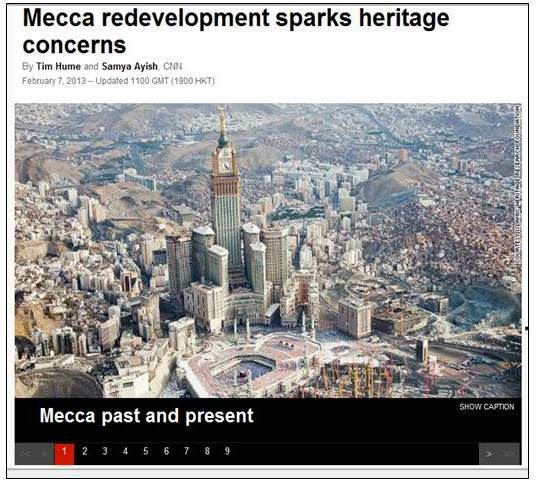 Over the past twenty years, fuelled by their petro-dollars and intolerant Wahabi backers, the Saudi authorities have embarked on cultural vandalism of breath-taking proportions. 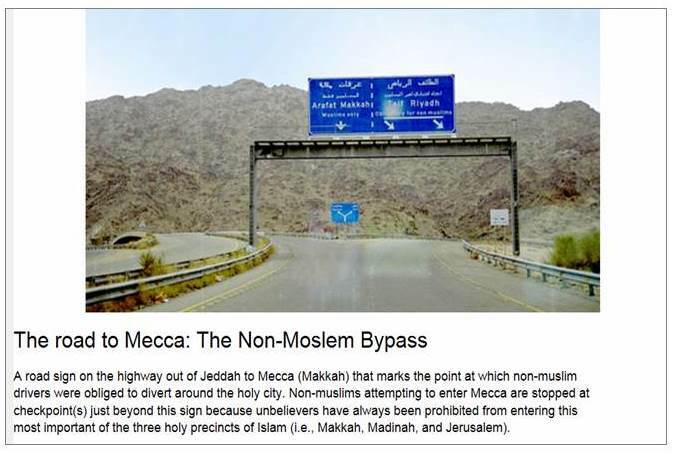 This means of course that from the monuments associated with Muhammad’s legendary “Night Journey,” only the Dome of the Rock in Jerusalem remains. 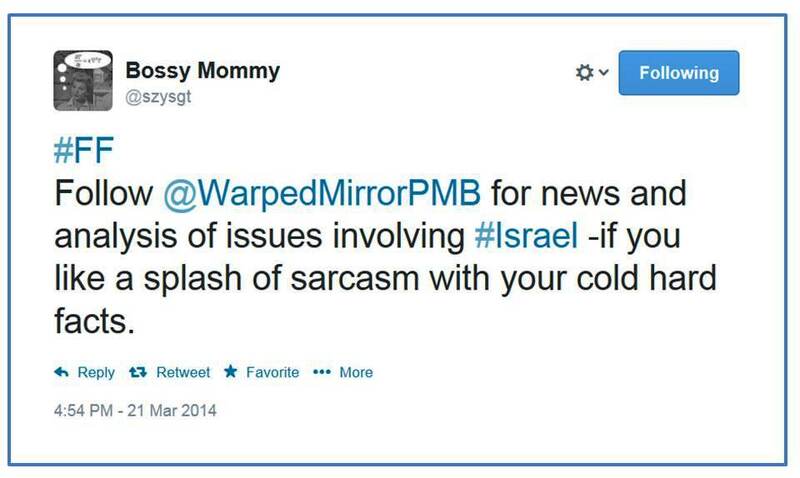 This entry was posted in JPost and tagged Islam, Israel, Saudi Arabia. Bookmark the permalink. What is most interesting (and, naturally, unreported by Islamic reporters) is that in Israel, developers in some parts of the country are almost afraid to put a spade into the ground, for fear of turning up an archaeological site and having to stop work until it’s been evaluated. Possibly even never to get develop at all, if the site is important enough. Don’t read that in the Islamic press. This means that if it was up to the Saudis, the Dome of the Rock and Al Aqsa Mosque would be plowed under. Interesting!